This is a turbulent time; there are storms all around. Disaster lurks at every hand. What are we to do when the storm hits us, or we hit it? Jesus is completely exhausted. For several days He has ministered to people with little or no sleep. He is carried to a boat that is to take Him to the other side of the Sea of Galilee. En route, a huge and unusual storm arises, nearly swamping the boat, and terrifying the disciples. They hurry back to Jesus, wake Him up, and plead with Him to save them. They’re not convinced He even cares whether they live or die. Several of these men were hardened fishermen, and yet this storm had them terrified. The Greek language paints a picture of a truly abnormal one of a kind storm, the kind of storm where one would normally expect people to be fearful. Jesus, however, was both surprised and disappointed with their fear. Fear in a life-threatening storm apparently was not a reasonable response for Jesus. He then asked them, “Where is your faith?” Jesus equates being in fear with having no faith. To Jesus, being fearful in a life-threatening storm was not an appropriate response. It is obvious that He expected more out of them, but what exactly were they supposed to do? It seems to me that they had only two real options. One was to realize that Jesus was in the boat, and because of that, ultimately they would be safe. They would have then gone to Him in faith, knowing that He was able to deliver them. The other option was to rise up in faith themselves and take the initiative. They could have spoken to the storm themselves, and let Him sleep. The disciples at this time were still way short of realizing either of these scenarios. They were still not convinced that having Jesus in the boat meant safety, let alone that they could rise up in faith and do the same. Just like these disciples, we in the Church today are not yet convinced of his power, and the fullness of the authority that He has invested in us. Jesus is our source of life, and there is no fault in running to Him in faith. However, there comes a time when we as followers should step up and do something ourselves. 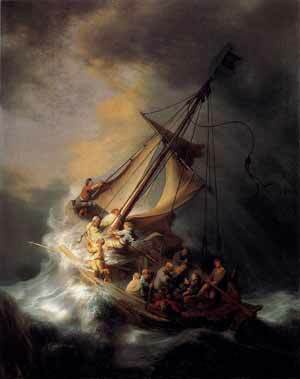 While in a storm, we would do well to realize that not only is Jesus in the boat, but that He is also in us. Let us strive in the Word and in his presence, to reach a place where we can speak to the storm ourselves. When we stand up courageously in his Name, it glorifies Him. I think it is interesting that it is our eyes that deceive us. We “see” a “storm”, whatever it may be. How things “look” make no matter. We should be blind to how the situation looks and seek to “hear” God…that “still small voice”. Amazing!! It is an opportunity to show God’s suverenty in your life to give you an experiencial knowledhge(Epignosis) of His saving POWER. i have acted like those followers. i am praying that my faith would grow .thank you for this reminder that i have nothing to Fear, my Jesus is always with me. Oh Lord help me with my unbelief.Amen.